Compatibility is a tricky thing. I believe many of us put way too much stock in instant chemistry, hoping that high levels of initial attraction will sustain the flame of passion, when really what we truly need is to build a firm foundation of friendship. To do so we need both emotional and intellectual compatibility. Instead we begin projecting our hopes and wishes on the other person we are physically attracted to, trusting that they will change to conform with those wishes. Yeah, you know that never happens and it is easy to spot this dynamic from the outside! Yet so many of us ‘forget’ when it comes to ourselves… So let’s start at the right end and analyse potential compatibility with a little help from the Tarot. Below is a great spread to use to see if you are compatible with a new partner as well as to see where you are at in your relationship with a current partner. It doesn’t tell you how the relationship will develop but rather gives you information and valuable insights which will help you make the right choices. 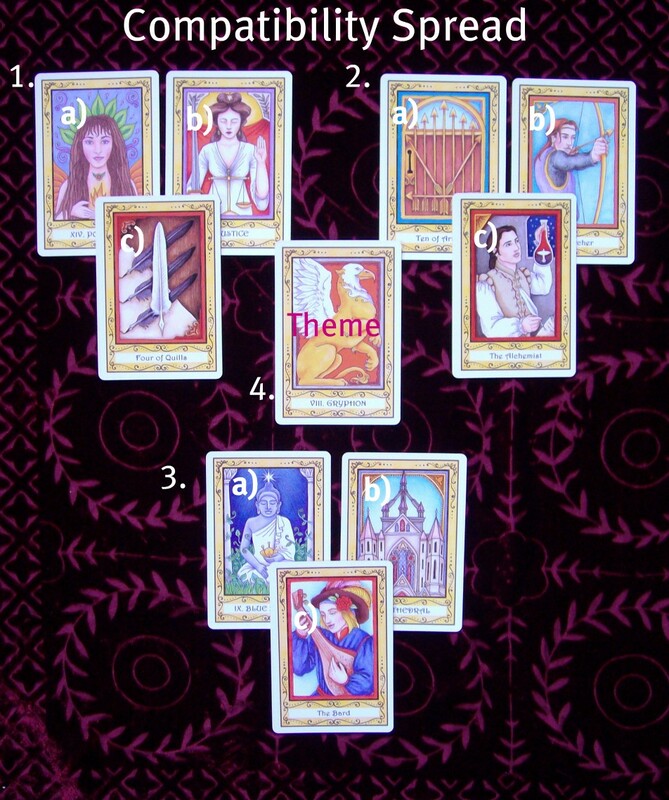 The layout below was created using the gorgeous Incidental Tarot deck by Holly DeFount. Do check out her Etsy shop! The first group of cards represents how you communicate. a) is how you communicate, b) is how s/he communicates and c) is what dynamic you are likely to create at the minute. The second group of cards represents your actions and how you move in the world. a) is you, b) is him/her and c) is how you would move together in the world… what impact you would have on people around you and how you would be perceived as a couple. The third group of cards is perhaps the most vital as it shows your ability to love completely. This group of cards can reveal issues on the heart chakra level. a) your ability to love b) his/her ability to love and c) what sort of love dynamic you create as a couple. This card is at the bottom of the spread because it forms the foundation of the relationship. Personally, I like to work with Elemental dignities for this type of reading but feel free to use another method if this suits you better. You can also take the quint for each of the groups to gain further insights. The quint is taken by adding the value of the number cards and the Majors together (don’t include the court cards) and reducing them to a number less than or equal to 22. This number will then correspond to a Major Arcana card and insights into the spiritual lesson for each group of cards. The central card shows a current theme and gives you a clue about the reason why you have been brought together at this point in time. Or, if you have been together for a while, what lesson you are working on as a couple right now.